In some ways, post-reunion Megadeth has been the strongest run of Dave’s career, each new album comfortably beating the last and providing a dose of quality modern thrashing from Mustaine and co. This peaked with 2009’s Endgame, a personal favourite, still a damn good set of songs, and so strong an album that Th1rt3en doesn’t quite manage to beat it. This album is a shift in style from Dave, moving away from the tech-thrashing and more towards the songwriting-led heavy metal days of Countdown To Extinction and Youthanasia – not automatically a bad thing, but sure to disappoint everyone still yearning for another Peace Sells... or Rust In Peace from the band. Some people want the moon on a stick; the past is the past, and modern Megadeth is a metal machine capable of putting out excellent material that stands up on its own, even with comparisons back. My largest disappointment about opening track Sudden Death here is in the missed opportunity with the spelling! Who couldn’t love the melodic introduction that soon turns thrashy, guitar flourishes after each lyric line and a killer chorus to boot? Lengthy instrumental passages simply pour out of the speakers at you, lovely molten metal that simply begs for thrown horns and headbanging – and this is just the first song! There’s a fair amount of variety in what follows, first single Public Enemy No. 1 simply oozing catchiness as a stellar example of modern ’Deth at its best. Dave has always sounded happiest when he’s singing about killing people and driving fast cars as opposed to FEMA and their continuing ideological drive to put people in concentration camps, and so it proves here. Whose Life (Is It Anyway) is a punky sneer-filled rant aimed at Dave’s wife/girlfriend/parents and their constant nagging, and works on that level, fun and infectious, before the slightly dull We The People goes back to Tea Party anthem time. Being fair to the ’Deth, there isn’t a single song on Th1rt3en that is actually bad, just ones that are slightly less exciting when compared to others. We The People, for example, has an absolutely killer solo, the guitarwork throughout the album being as brilliant as you’d expect from a player of Mustaine’s calibre. Endgame’s Chris Broderick returns alongside him here, with drummer Sean Drover and bassist Dave Ellefson (!) returning to round out a top-notch lineup. Whatever the band aim at they make mostly killer, from the groovy stomp of Guns Drugs & Money to the technical maelstrom of Never Dead, after some melodic meander at the start shooting straight in with thrashy laser precision. This isn’t an album that reveals all its wonders on a first listen. For example, the initially rather dull New World Order turns out to be a rather brilliant thrasher given a chance, the deceptively simple Fast Lane showing itself far more complex than you thought, and so on. Don’t listen expecting to have your ears thrashed off, but do listen expecting a fun album. Dave’s voice went from being a metal in-joke to something quite capable of carrying a hook long ago, and as the likes of Black Swan here proves, he’s honed that talent to a fine art. Even the closing, balladic title track works, Dave telling us how he’s stood and faced the world thirteen times, an album a time, and is still going. 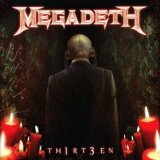 Long may he do so – Th1rt3en may not be the most exciting Megadeth release, but it’s a more than solid album, and continues to grow in my estimation each listen. It’s not a Endgame-beater, however, and that remains my favourite of the post-millennial ‘Deth releases.